Customizable Dual Letter Blocks Illusion by Lyl3 is licensed under the Creative Commons - Attribution - Non-Commercial - Share Alike license. This is a display stand made of a sequence of blocks that are each shaped like two different letters when viewed from two orthogonal viewpoints. 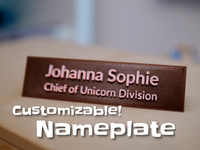 You can make a stand with any words or names of your choosing by running the customizer app. You can use letters, numbers, a space character, or any of the special characters: $&<>*[email protected]/\♥♠♦♣♪♫♀♂←→π. You could also make a 3D monogram of your initials with just a single letter block. If you want a 3-letter 3D monogram block you can try your luck with my Customizable Triple Letter Blocks Illusion. It's not obvious from the images of the STL files, but in addition to the "I♥U MOM" cover model which is scaled at 80% in the Z direction, I've included "I♥U MOM", "I♥U DAD", and "I♥U MUM" as generated by the app with scaling set to 2. Note: although the instructions in the customizer tell you to use UPPERCASE characters only, using lower case characters is fine as long as they're paired up with characters of the same height; bass/drum is fine, but bass/fish isn't because the last two letters are different heights. If your model has a non-zero base, it will require support structures on the model itself and not just on the build plate only. Actually, not all letters require support, so you might be able to get away without supports if you don't use any of the letters C,E,F,G,I,P,S,T, or Z. Those letters absolutely require support. If your model does need supports, you'll definitely want to use soluble supports if that's an option available to you. If your model needs supports and soluble supports isn't an option, you might want to print the letters separate from the base and use Cura's tree support structure. It's still experimental and is glitchy, but I have had good success with it: whenever it generates messed up structures I just move the model and then moved it back and get it to regenerate. If you're not using soluble supports, I'd recommend printing a test of the worst letter combination that you plan on printing and tuning the support settings with it. To that end, I have included the "W/G" letter block to go along with the "WELCOME/GOODBYE" model. If you generate a model with your desired words or names, examine it in your slicer with supports enabled and determine which looks like the worst letter combination for support removal. Then generate a model with only that block to use to tune your support settings. If you're not going to paint it, printing with white filament would be a good idea since all scars from the support structure will be white no matter what color filament you use, but the scars won't be visible with white filament. If you're using disolvable supports, you might want to use black filament or another dark color to reduce the visibility of shadows. The font used is Overpass Mono Bold from the Google Fonts repository. The choice was very limited as it had to be available to the customizer, it had to be monospaced, and the Q had to be distinguishable from an O with the descender portion cut off. This was the only font that fit all the criteria. 2019-03-26 V1.1: After noticing that the code ran quite slow in the Thingiverse customizer, I realized that I had the number of fragments set higher than needed. I've set the number lower and it runs much faster now (but not blazingly fast). 2019-03-26 V1.2: Modified the code to resize and position some special characters: "$<>♥♠♦♣♪♫♀♂←→π". 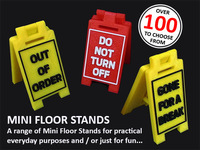 Those should all be printable now. You can copy them from here and paste them into the customizer. 2019-04-08 V2.0: Added the capability to add small flat characters to the base after noticing that two of the most popular non-parametric dual letter things had little hearts on the base. It looked like a nice feature that some people might want, so it's available as an option now. Also now produces separate STLs for each part (letter blocks, base, flat characters) as well as an STL with all parts.